If you’re reading this, then you are probably learning English, or at least considering starting. But WHY are you learning English? And what motivates you to keep learning? I recommend you first watch the video, then read the text to get the full message. Do you know what’s missing in this list? Very few learners can say that their main motivation for learning is that they love the language or they are passionate about it. However, this is one of the best inspirations for learning a language! So it’s important to start with a fiery passion for the language, which will make you unstoppable in your learning! That said, in a globalizing world, being able to communicate with people from other countries is more important than ever. And English just happens to be the most widely spoken language in the world. Almost any international company is going to value employees that can speak English over ones that can’t, and for more and more jobs it’s a necessity! Plus, many companies will pay up to 20 percent more to someone who is multilingual. By speaking English as a second language, you’ll be more open to ideas coming from other countries and markets, and this will make you an asset (valuable member) to practically any company. And what about self-employment? If you’re fluent in English, so many opportunities open up to you, like teaching private classes, interpretation, translation, internships, and jobs abroad. If you want to be more successful, then that’s a damn good reason to learn English; come at it with passion, and you will be implacable! What better reason to learn English is there than being able to connect with people all over the world? It’s definitely my top motivator! You can make friends both online (internationally) and in your own city (locally) through English. Start in an international community, like RealLife English. You can find support and inspiration from learners like yourself that are passionate about improving their English! You can make friends to talk with on Skype and practice speaking together and get all sorts of cool English learning resources. You can even meet people in your own city with whom to practice your English. You may be able to find members in our community, or other English learning communities, that live near you. 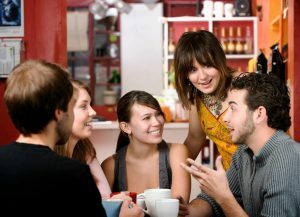 If you’re really motivated to meet both native and non-native English speakers in your community, I recommend that you read this article. Almost everywhere you go, you can encounter English: English music, television, movies, news, etc. This is because of the huge influence that American and British culture have all over the world. Wouldn’t you like to understand the music that you and your friends enjoy? How about translating the lyrics for your friends and family? You’ll find that most people are very impressed with this. In addition, watch movies and televisions shows in their original format – you’ll never have to put up with (tolerate) the annoying dubbed over shows where the words don’t fit the mouths’ movement. If you get the chance to travel, you’ll be able to experience the local culture so much better if you can talk to and meet locals. Imagine visiting a new city and being able to ask a local about the best restaurants, must-see attractions, and the most fun pubs. Getting the local experience is so much better than reading a guidebook. In fact, I never travel to a new country without knowing at least a few key phrases! Let’s move beyond semantics, learning a language often leads to self-development (that is, improving yourself and contributing to a better world). Learning a second language makes it much easier to learn a third because you not only grow certain areas of your brain, but you also learn the strategies for learning languages that work the best for you. You get to know your own learning process, which can really help you in aspects of your life that you would never expect (for example, studies show that learning a second language makes you smarter and healthier). Having a way to communicate with people from other parts of the world will help you to break down barriers like cultural differences, stereotypes, racism, and prejudice. Every day in the RealLife community we see people sharing and learning about each other’s cultures. I honestly believe that if everyone in the world had a common language, we would learn that in essence, we’re all more similar than we are different. We’re all human beings, and few people would want go to war and kill people that are basically just like themselves. So, do you want to foster peace in the world? Then learn English and become a citizen of the world! 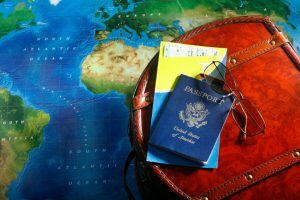 English truly is your passport to the world. It can make you more successful, help you meet really interesting people and make friends, discover new cultures, and become a citizen of the world. We encourage you to take advantage of all of the resources we offer on this site. It’s our mission to help you revolutionize your English and reinvent your life in a variety of fun and pragmatic ways. Want to learn more? Then remember to sign up for our email list and get our free ebook: “101 Words You’ll Never Learn in School”. If you enjoyed this article, then comment below three ways that you plan to revolutionize your English this week! We’d love to hear from you. Excellent article!!! It is exciting to know other people feel the same about English. Thank you!!! Very in-depth, practical, and engaging. The video was a really nice touch and helped bring the article alive! With a little hard work I'm sure you will! I show this article to my students, and they like. It is really useful for English learning people. Very nice it will be solve my problem. Good article, I really enjoy read it! What a fantastic article ethan! Thankful. What a good article! things like this motivates people as me, I totally enjoyed reading it. Thanks ethan. Thanks for the terrific comment! Have a great weekend. Very good article! Congratulations, Ethan. What an article! I will keep on updating myself through reading these each and everyday of life. Thank you. That’s AWESOME! I love the proactivity. Keep it up. First of all, I wanna say that I love all your articles. On the other hand, learning english is a long process that involves searching of new methods for improving step by step our english knowledge. congrats! This site is great and also invaluable help. I was thinking about to create a group for learning to write essays. In my opinion, this is very important if we wanna improve our vocabulary. I have noticed when I write something for a friend or for posting on facebook or twitter that I gain more vocabulary faster that when I read. So, I propose opening a group for interchanging short essays and looking for a native teacher to correct or advise how to do better our work. Como demorei a encontrar esta comunidade..HÁ 6 anos que venho tentando aprender ingles, mas por um motivo ou outro parei, tive que desistir ou mesmo na escola nao tirei o tempo suficiente para aprender. Mas em fim nao dá para adiar mais e estou no lugar certo. Dantas. i’m happy to write to you because i learned from your valuable videos and articles also the comments which written by participates. I loved the song at the beginning and the end of the video. I searched and found it. It really matches with the purpose of the article. Overcome barriers and struggle to learn English. If you want, you can do it. Thanks for your feedback. I’m glad to hear that! I hope that English is changing your life and will continue to do so :). Hey Jackeline that’s great to hear! I’m so happy that this helped inspire you, and I hope some of our other resources will help you, too! Best of luck to you! Every article has a powerful positive message, thanks. there’s nothing that you can’t do if you know how to speak english. but having a limited vocabulary can also limit your chances of being recognize by the world. one thing that can help you with this is by reading. any reading material – book, comics, magazines, newspaper, documentaries, etc. – that you can get your hands in to just READ them! read them more than once, familiarize yourself with the words, how they were used, how they made an impact on you, and before you know it they’ll become a part of you. and once you are equipped with it you’ll be confident enough to face just anybody. there’s no stopping you from conquering the world and the possibilities are endless!